Global datacenter expansions are happening at a rapid pace, driven by the ever-increasing demand for digital information. With IP traffic growing at over 20% per year, continuous network technology innovation is required to meet the needs of consumers and business. Next-generation metro data center interconnection solutions aim at doubling the symbol rate to reduce the cost per bit, rack and energy consumption without substantial infrastructure investments. What’s needed? 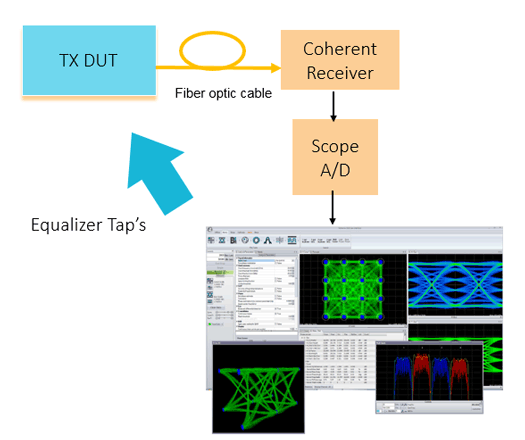 An end-to-end Coherent Test Solution that is fully calibrated and automatically controls and calibrates multiple Optical Modulation Analyzers (OMA) to reduce measurement errors and accelerate product design cycles. To tweak coherent optical transmitters for optimal performance, impulse response information needs to be known. Where many solutions adjust equalization based on a trial and error approach, making adjustments based on the device’s characteristics saves time and results in better performance. Tektronix provides an end-to-end automated coherent optical device optimization and test solution to analyze the device under test’s characteristics and provide the best possible setup parameters to deliver the highest performance and best yield in the shortest amount of time. 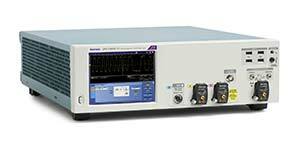 Multi-channel research of multi-Optical Modulation Analyzer’s test systems is challenging and difficult. Synchronization and phase coherent acquisition is critical, but can be influenced by external and internal factors. The key to making measurements on coherent optical systems relies on the ability to correct and adjust these factors to provide clean test signals that are known and repeatable. The Tektronix OMA software automatically controls and fully calibrates multiple OMA systems to reduce measurement errors, increasing the confidence in your analysis. Detect 100G and 400G complex modulated signals with precision. Use the powerful included analysis software for complete characterization of coherent optical devices and systems. Offering built-in, narrow-linewidth lasers and completely automated or manual modulator bias voltage control, the OM5110 Multi-format Optical Transmitter provides the performance, flexibility, and convenience required for generating 100G and 400G coherent optical signals. The OM1106 Optical Modulation Analysis software offers a complete suite of tests, measurements, and visualizations for a wide variety of coherent optical signals. It provides the user with the capability to completely customize the signal processing to meet a wide range of requirements. The DPO70000SX Series Oscilloscopes provide unprecedented flexibility for complex modulated signal acquisition. Configure the system for 100G analysis now, with the flexibility to grow into 400G capability. As multi-level coherent optical signals become more prevalent, the flexibility of an arbitrary waveform generator becomes a requirement. Together with RFXpress, the AWG70000 Series is capable of generating current and next-generation multi-level signals. Perform comprehensive characterization of dual polarization intradyne coherent receiver components with a shorter test time than a lightwave component analyzer. As demand for data increases, network operators continue to search for methods to increase data throughput of existing optical networks. To achieve 100Gb/s, 400Gb/s, 1Tb/s and beyond, complex modulation formats have become prevalent. These modulation formats present new challenges for the designer when it comes to choices of test equipment. Quickly and easily identify the cause of coherent optical transmitter and receiver impairments with this reference poster. Common to all digital communications systems is the need to characterize bit error rates (BER). In this application note, you will learn how the Tektronix OM4225/4245 Coherent Lightwave Signal Analyzer enables access to the complete set of variables for characterizing complex optical signals on fiber.